Steak and shrimp on a white plate with a side of mixed vegetables. 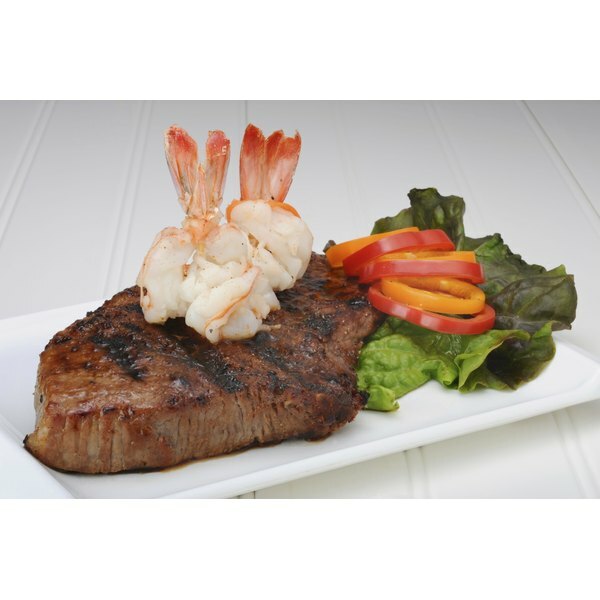 A very popular meat duo is steak and shrimp. It is so popular, in fact, that it boasts its very own nickname of surf and turf. If you choose a lean cut of steak to pair with the shrimp, you can create a delicious and healthy entrée full of flavor and low in overall calories and fat. The leanest cut of steak is the top sirloin steak, containing very little fat and calories per serving. A serving of shrimp only contains 1 g of fat and less than 25 calories. Allow the steak to sit at room temperature for 30 minutes before cooking to ensure even cook time. Remove the head of the shrimp, if it is still attached. Peel the shell back and off the shrimp, starting from the head end. Leave the tail on, if desired, for presentation purposes. Use a very sharp knife to cut along the backside of the shrimp, about ¼-inch deep to expose the brown vein. Remove the vein and place the shrimp to the side until time to cook. Rub the outside of the meat with olive oil and season with salt, pepper and other seasonings of your choice. Garlic powder, onion powder, cumin and chili powder complement the flavor of steak well. Heat the olive oil in the skillet to medium high. Place the steak in the pan and cook for 5 minutes per side for medium rare. Set the steak to the side while you cook the shrimp. Pour the shrimp into the hot pan from which you just removed your steak. Sprinkle the shrimp with a little salt and pepper. Cook the shrimp for 2 or 3 minutes or until it turns pink. Remove as soon as it turns pink to avoid overcooking. Serve the steak and shrimp with seasoned steamed vegetables or whole-wheat couscous for a well-rounded, healthy meal. Never buy or cook shrimp that has the smell of ammonia to avoid serious illness.